On April 22, long lines formed in South Africa as its citizens went to vote for the political party that will lead the country for the next five years. The African National Congress (ANC), the political party that has been in power since the country’s first democratic elections in 1994, won the elections again. The ANC won by a large majority (66%), but it is less than what it had won by before. So the party has lost support from some South Africans. The ANC had a lot of problems this last year. The previous president of South Africa (also of the ANC) didn’t get along with the leader of the ANC, Jacob Zuma, and resigned in September last year. A caretaker president was assigned till the elections. Also, Zuma was accused of using his position to make money for himself and had some charges against him, which were dropped. The next president of South Africa is going to be chosen by the country’s parliament. Zuma is expected to be selected. One of the biggest issues that South Africa faced in the last century was apartheid, where people of different races were treated differently. The ANC was founded in 1912 with a goal to fight for the rights of people of mixed race and black Africans. Apartheid came to an end in the 1990s and South Africa became a democracy. Nelson Mandela (also belonging to the ANC) became the first president of apartheid-free South Africa in 1994. 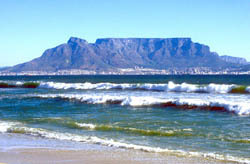 One of the famous landmarks of South Africa is Table Mountain in a city called Cape Town. Its name certainly describes its shape – a wide flat top that is about 3 kilometers (2 miles) wide.